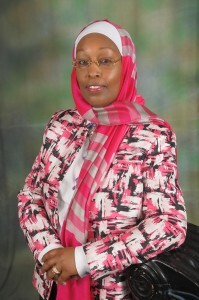 The Honorable Lady Justice Jamila Mohammed is a Judge of Appeal within Kenya’s national Court of Appeal and is the Chairperson of Kenya’s National Committee on the Prevention of Genocide, War Crimes, Crimes against Humanity and All Forms of Discrimination, having previously served as Vice-Chairperson. 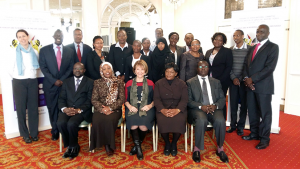 Lady Justice Mohammed was also previously the Vice-Chairperson of The Federation of Women Lawyers (FIDA -Kenya) and is currently a member of the Kenya National Committee on the formulation of the Kenya National Action Plan on UN Security Resolution 1325 on Women, Peace and Security. In the autumn of 2012, Justice Jamila attended AIPR’s Global Raphael Lemkin Seminar in Poland. What is the current state of atrocity prevention in Kenya? What are some of the activities, planned or completed, that you think will be especially effective towards this goal? The current state of atrocity prevention in Kenya is that different organizations and the Government are carrying out many activities with a view to preventing atrocities. The Kenya National Committee on the Prevention and Punishment of the Crime of Genocide, War Crimes, Crimes Against Humanity and All Forms of Discrimination (KNC) is made up of representatives of various organizations, government and non-government, that deal with the prevention of atrocity crimes. The KNC is therefore well-placed and well resourced to spearhead and coordinate atrocity prevention activities in Kenya. The KNC has undertaken training and capacity building for its members and continues to enhance their capacity. This is in the realization that well informed, skilled, and committed members can be agents of change and are the single most important resource in atrocity prevention. The KNC held a peace forum in Mombasa in 2013. The Committee plans to hold many other peace fora in identified hotspots, particularly as Kenya prepares to hold General Elections in 2017. Plans to establish a Memorial or memorials such as peace parks in the capital city, Nairobi and other strategic locations to commemorate past atrocities and promote prevention. Collating Early Warning and Response Mechanisms and tools used in Kenya during the 2013 General Elections. This is in realization that election periods in Kenya are volatile and have in the past been characterized by violence. The culmination of this was the Post Election Violence (PEV) that followed the 2007 elections. A lot of effort was made by different organizations towards early warning and early response to ensure that Kenya enjoyed relatively peaceful elections following the General Elections that took place in 2013. The KNC intends to collate the mechanisms and tools used to make the difference between a peaceful election and one rocked by violence and atrocities. The lessons learnt will be used to guide policy and action as Kenya prepares for General Elections in 2017. 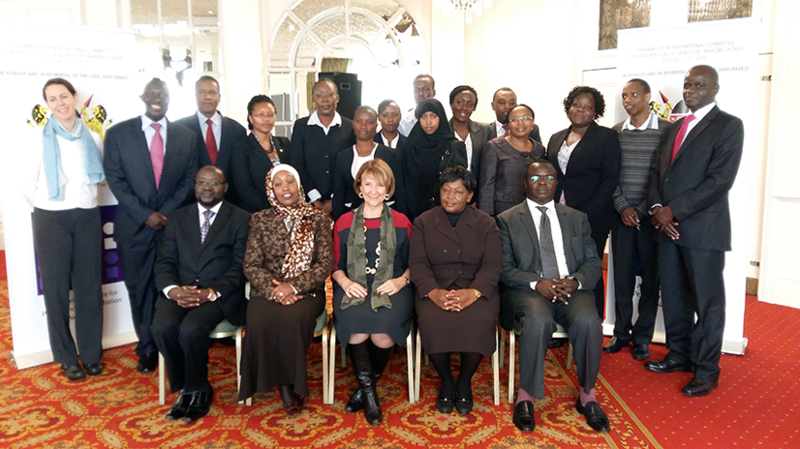 The best practices will be replicated in the future in Kenya and in other countries. The information gathered will also be used by the KNC to plan activities such as peace fora in identified hotspots with a view to preventing atrocities in the 2017 General Elections. Spearheading the formulation of Genocide Prevention Policy and legislation. Considering ways in which punishment can be used as a mechanism to prevent future atrocities, as the KNC’s mandate includes this aspect. We often think of justice as a mechanism of accountability that is used to address events of the past. A good reason for this is that justice pertains to actions of the past. The primary objective of any tribunal, national or international, is the provision of impartial and equitable justice for past crimes. However, undertaking judicial processes related to the prosecution of atrocity crimes has other important benefits, such as deterrence of future crimes, the institution of reconciliation processes, and maintenance of peace and security. The Judiciary of Kenya is in the process of establishing an International Crimes Division. The KNC will endeavor to input into the process. What do you believe is the future of effective prevention in the field of law? The future of effective prevention in the field of law, in my view, lies in a multi-pronged and multi-stakeholder approach. It must be tackled in different ways and by many stakeholders working individually and collectively towards the common goal of atrocity prevention. Atrocity prevention requires political will, support and commitment. The KNC is a platform through which different organizations work together to prevent atrocities. Continuous learning and networking between members of different National Committees is important to share best experiences and best practices and as a peer review mechanism. Interaction between the National Committees and Regional Committees is also important. The role of women in atrocity prevention should be recognized. The UN Security Council Resolution 1325 on Women, Peace and Security highlights the importance of the role of women in peacebuilding. The resolution reaffirms the important role of women in the prevention and resolution of conflicts, peace negotiations, peacebuilding, peacekeeping, humanitarian response and in post-conflict reconstruction and stresses the importance of their equal participation and full involvement in all efforts for the maintenance and promotion of peace and security. Further, collaborations, partnerships, networks and inter-linkages between the different Networks (such as the African Network and the Latin American Network) will go a long way in nurturing a committed pool of agents of change, nationally, regionally and internationally. Alumni meetings similar to the one that took place in Arusha, Tanzania in May 2013, should also be held annually to share experiences and best practices. While it is difficult to measure prevention, the impact of concerted and incremental measures of prevention is evident. A case in point is the relatively peaceful General Election held in Kenya in 2013, which contrasts with the 2007 General Election, when violence erupted. In my view, concerted and incremental measures such as early warning and responses worked together to prevent violence and atrocities. A totality of combined efforts and actions culminates in atrocity prevention. The future lies in nurturing and fostering partnerships and collaborations. It lies in the knowledge that if we all pull together, we can make a difference and ensure that atrocities are prevented. I am motivated by the desire to have a peaceful world. A world where we all live in harmony and dignity. A world where every life is valued and protected. The post-election violence that Kenya experienced in 2008, which followed the 2007 elections, was a turning point in my life. I am motivated to work towards achieving peace when I recall the violence and atrocities that took place at that time. Until then, Kenya was relatively peaceful and was viewed by many as a haven of peace: it acts as a host to many refugees from many neighbouring countries. Our leaders have brokered peace for many warring neighbours. From that experience, I learnt that conflicts and atrocities can happen in any part of the world. We watched as hitherto friendly neighbours turned on each other and killed, raped and maimed each other. The world is a global village and what happens in one part of the world affects all, particularly the neighbouring countries. An analysis of the PEV shows that there were many underlying causes. As a result, in 2008 Kenya begun a raft of reforms in a bid to deal with the causes of conflict. The reforms included constitutional, judicial, land, police and electoral reforms. Attending the Raphael Lemkin Seminar, Global Edition in 2012 in Auschwitz, Poland further fortified my resolve to prevent atrocities. It was a powerful experience that utilised the ‘power of place’ and made me come face to face with the horror, pain, anguish and inhumanity of Genocide and mass atrocities. The experience vividly brought home the lesson that genocide and mass atrocities are committed by human beings upon their fellow human beings and that the heinous crimes can be committed in any part of the world. It also brought home the lesson that the key to dealing with genocide and mass atrocities lies in prevention. Auschwitz was an unforgettable experience that I will remember all my life. It was a stark reminder of the magnitude of atrocities. I left Auschwitz with the unshakable resolve to do everything within my power, individually and collectively with like minded people, to prevent atrocities. One life lost to genocide and atrocity is one life too many. Let us all work together to prevent atrocities. Recognizing that sustainable development, democracy and peace are indivisible is an idea whose time has come. I am also inspired by the late Dekha Ibrahim, a crusader for peace in Kenya. Dekha worked with passion and commitment for over 15 years in peace, conflict transformation, and development work with pastoralists, advising and partnering with countless organizations and communities. She was honored with the 2009 Hessian Peace Prize in Germany, the 2007 Right Livelihood Award from the Swedish parliament, and as the 2005 Kenya Peace Builder of the Year. In 2005, she was nominated for the Nobel Peace Prize as a part of a group of 1,000 women working for peace across the globe. As a Recipient of the Right Livelihood Award, the Jury commended Dekha “for showing in diverse ethnic and cultural situations how religious and other differences can be reconciled even after violent conflict, and knitted together through a cooperative process that leads to peace and development“. Finally, I draw inspiration from the late S.K. Maina, the first Chairperson of the Kenya National Committee. I served as his Vice-Chairperson and had the opportunity to work with him from 2012 until his demise, on August 9, 2015. S. K. Maina was a warrior of peace and passionately worked in the area of peace building. He mentored and worked with many crusaders of peace and built a solid foundation for the Committee, upon which his legacy will continue to live. I am proud of the passion and commitment of the members of the Kenya National Committee in atrocity prevention. I am also proud of the support that we are getting from our Partners such as AIPR, the Office of the Special Adviser on the Prevention of Genocide, and from other National Committees, notably Tanzania and Uganda as well as from the Regional Committee. There is a lot of optimism surrounding the Committee, and, in partnership with others, we shall endeavor to ensure that “NEVER AGAIN” will our country, Kenya, be rocked by the kind of violence and atrocities experienced in 2008. We are resolute that the PEV of 2008 will be a memory and a lesson we shall all live with, learn from, and make all efforts to ensure that violence and atrocities do not recur.